AND THE CHALLENGE IS SENT!!! DO YOU ACCEPT?? @jsusga @jsucab @collegiate100jsu @theeilove @maddramajsu @girlscoalition.jsu @sonicboom_ots @jacksonstateu #DJMSDonates #TigerPantryChallenge #theeilove • Brought to you by The Department of Journalism and Media Studies! First lady Deborah Bynum has shared that 36 percent of students do not have enough to eat on college campus throughout the country. Upon learning of this alarming statistic, students majoring in journalism and media Studies at Jackson State University answered the call to help combat campus hunger and challenged fellow Jacksonians to do the same. 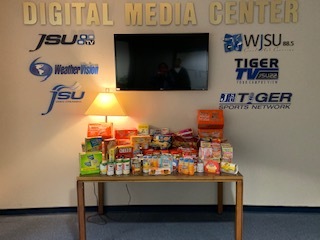 Additionally, when staff members of The Blue & White Flash campus newspaper discovered the first lady’s Tiger Pantry initiative, they joined forces with PRAM (Public Relations Association of Mississippi) members and other DJMS students to collect food items to donate. Walker says that when word got out in the department of what they were trying to do, students were more than willing to donate to the cause. “It was great to see that so many students wanted to help. We may have a small department, but we have big hearts!” he exclaimed. Christopher Rash, a journalism and media studies student, wanted to help students who may not be able to go home during the holiday break. “Any opportunity to give back is truly a privilege. It was humbling to know that we were assisting fellow students, some who may not be able to be with their loved ones during the holiday season,” said Rash, a senior. When Dr. Elayne H. Anthony, department chair, heard of the students’ efforts, she offered the journalism department’s full support. Anthony explained that the students decided to write a print story for The Flash, produce a video for Tiger Report and use social media platforms to challenge other JSU students. The drive, which lasted from Nov. 5-15, collected a total of 401 items. On Nov. 16, the items were donated to the Tiger Pantry, which is located in Campbell Suites North. During the donation, Campbell North Hall Director Sean Wallace explained the need for the pantry and also how contributions could be made and how residential and commuter students could request food assistance. He added: “We are trying to help alleviate those types of choices by providing some assistance with food and toiletries. Students needing to request items can find the Tiger Pantry link under Housing on the JSU website. To keep the items flowing into the pantry, the DJMS students challenged several organizations via Instagram using the hashtag #tigerpantrychallenge and #djmsdonates. The challenges included: Collegiate 100 giving men’s toiletry items; Girls Coalition donating women’s toiletry items; MADDRAMA giving jelly to accompany penut butter already received; Student Government Association and CAB were challenged to donate chicken soup and crackers, and The Sonic Boom was challenged to give microwaveable meals. The students hope that once an organization accepts the challenge and donates, they will then keep it going by challenging another JSU organization. For more information on how you can help or donate, email Campbell North Hall Director Sean Wallace at sean.a.wallace@jsums.edu.